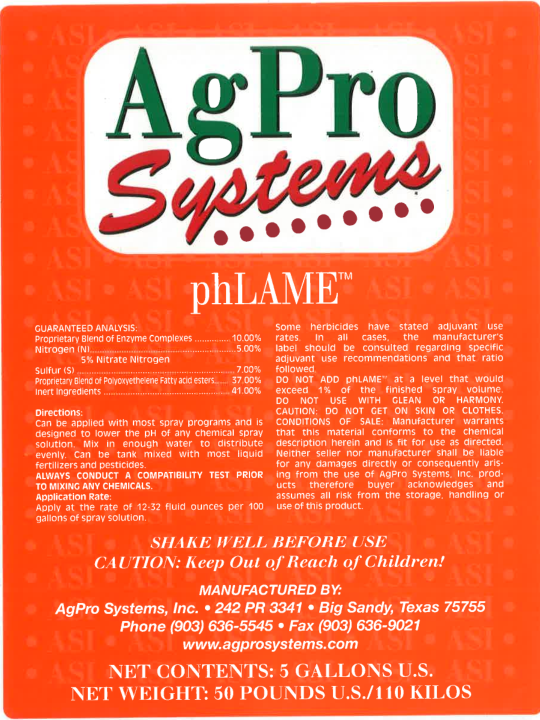 AgPro™ phLAME is formulated to enhance defoliants and other herbicide applications. The specialized surfactant spreads the treatment while the enzyme complex helps complete plant chemical intake. It also works well as a buffer to lower pH, which enhances most spray solution effectiveness. AgPro™ phLAME is a superior herbicide and defoliant enhancer which has continually proven itself to both growers and applicators. phLAME gives more complete and extended kills with the lowest herbicide application rates. Shake well and mix in enough water to distribute evenly. Can be tank mixed with most liquid fertilizers and pesticides. Use in conjunction with a good soil test and soil fertility program. AgPro™ phLAME can be applied in existing spray programs. Always conduct a compatibility test prior to mixing any chemicals. Apply at the rate of 12 to 32 fluid ounces per 100 gallons of spray solution. In all cases, herbicide manufacturer’s label should be consulted regarding specific adjuvant use recommendations and that rate followed. DO NOT ADD phLAME at a level that would exceed 1% of the finished spray volume. Add phLAME and mix with normal agitation.